In the current forecast, the driver shortage will be about 110,000 drivers by 2022, so it appears that the driver shortage problem has improved by 130,000 drivers since the 2013 forecast. “There’s been a driver shortage for as long as I’ve been in the industry, yet we always manage to ship our products and get them to our customers on time,” is what I often hear from transportation executives at manufacturing and retail companies who are skeptical about the problem. As you can see, based on 2013 data, there’s a greater percentage of persons age 65 or older (6.1%) employed in the trucking industry than there are 20-24 year olds (4.9%) — and the gap is getting worse with time. 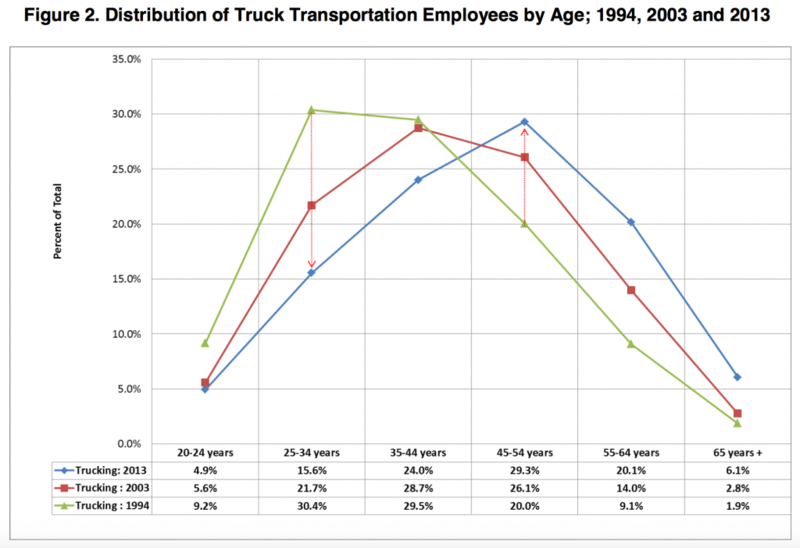 Regardless of the statistics, what can the trucking industry do to attract, hire, and retain more drivers? I offered some ideas in a July 2014 post titled, Driver Shortage in Trucking: Time for Plan B. “The only way to solve the driver shortage problem is through innovation,” I argued. “It’s already happening on the equipment side with the development of self-driving trucks. The time has also come, I believe, to innovate the trucking industry business model and processes.” Read the post for one of my ideas. “Just pay drivers more and you’ll fix the problem,” is the most common solution I hear from folks. According to the Bureau of Labor Statistics, heavy and tractor-trailer truck drivers earned a median wage of $40,260 in 2015. But trucking companies have been offeringing signing bonuses and increasing wages and benefits for a few years now. According to the American Transportation Research Institute, driver wages and benefits increased by 5 percent and 18 percent, respectively, in 2016. With fuel prices relatively low today, driver wages are now the biggest operating expense for motor carriers. But as I highlighted in my July 2014 post, “Truck Drivers are Treated Like Trash With No Rights,” although paying drivers more is certainly a step in the right direction, it’s not enough to solve the driver shortage problem. As one driver commented, the main reason trucking companies can’t keep “the seats in their trucks filled” is that drivers are treated poorly (“like trash with no rights”) by their employers, the Department of Transportation (DOT), shippers and receivers, and the general public. For related commentary, see If You Spend a Week with Your Carrier’s Driver and What Carriers Look For in Shippers. Lower the minimum driving age to 18: Right now, the minimum driving age for commercial interstate truck drivers is 21. Earlier this year U.S. Rep. Claudia Tenney from New York introduced the WHEEL Act that would allow for 18 to 21 year olds to operate commercial vehicles across state lines as long as they meet certain conditions. While this would increase the available pool of drivers, it also raises concerns about the impact on highway safety and insurance rates. Recruit more female drivers: women make up nearly 47% of all U.S. workers, yet only comprise 6% of all truck drivers. Watch our November 2014 Talking Logistics episode, The Benefits and Challenges of Attracting More Women to Trucking. Recruit more minority drivers: 66.6% of the truck driver population is currently made up of white males, based on 2014 data, followed by Hispanic men at 14.6% and men of other nationalities at 14.8%. So, is driver shortage getting better, worse, or is there no problem at all? Post a comment and share your perspective!